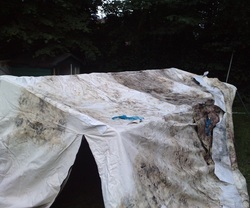 Why you should never put away a tent damp. The 150th runs many camps. If the weather on the last day of camp is wet, it means tents have to be put away damp. You may have seen tents hanging in the hall or stretched out in the churchyard. This is to dry them. You can see below the damage that happens once mould takes hold. 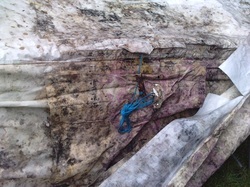 Once a tent has mould, takes so much time and money to treat that it is cheaper to simply buy new canvass. A tent like this one would cost us around £1000 to replace. Even if the tent was pitched without the canvass ripping, the mould spores are not healthy to breathe in, so it still could not be used. With thanks to 123rd Manchester Scout Group for allowing display of these images. Have you bookmarked our webshop?